Send check or money order to: Carol S. Ferrier, 24 Julia St., Kyabram, Victoria, Australia 3620. Author will be happy to sign books if requested. Carol S. Ferrier is a wife, mother and grandmother. Carol and her husband David have been married for over forty years and have four daughters and twelve grandchildren. For the first twenty years of their marriage they ran a small dairy farm just south of Kyabram. They then moved into Kyabram township where they have lived ever since. Carol worked in the plant and landscape trade for about fifteen years before retiring. She has been writing poetry and children's stories for the last five years. This book is about different phases and happenings experienced in our everyday life. Some are about the social issues of the world, others about happenings in the lives of friends and family. Ranging from births, birthdays, wedding and deaths, as well as all the wonderful everyday events of living life, and show how we can overcome when we place Jesus in the centre of our lives. 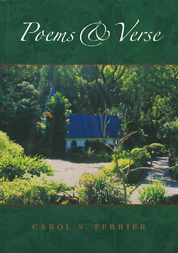 This truly is an uplifting little book of poems and verse that will bring joy and pleasure to the reader.